This is “Arabs, Islam, and Oil”, section 8.5 from the book Regional Geography of the World: Globalization, People, and Places (v. 1.0). For details on it (including licensing), click here. Summarize the physical features of the Arabian Peninsula. Understand the main economic activities of each country. Describe the types of governments found in the region. Outline women’s rights and circumstances in each country in the region. The Arabian Peninsula is a desert environment surrounded by saltwater bodies. 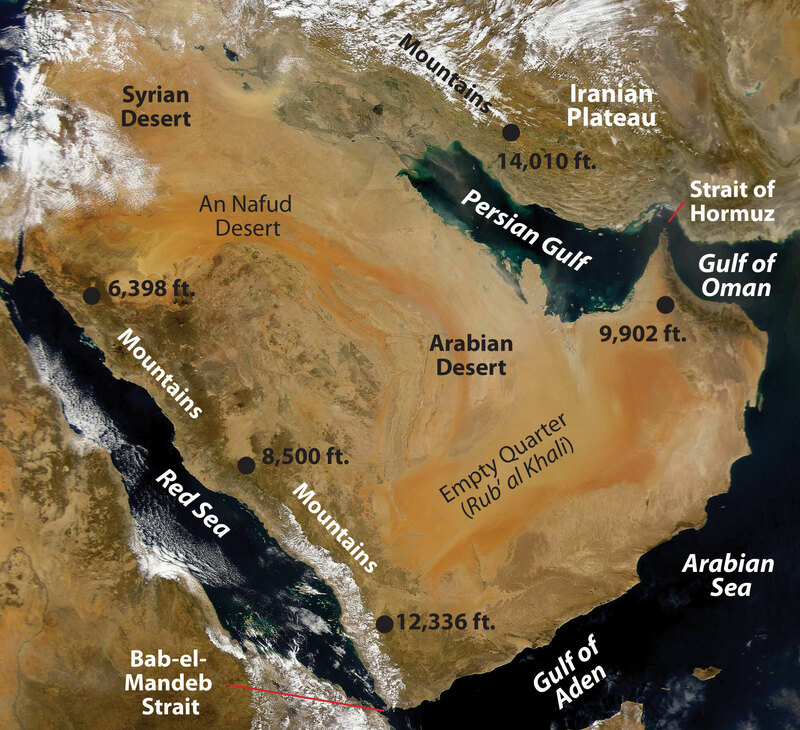 The Persian Gulf, the Arabian Sea, and the Red Sea border the peninsula on three sides. Arid type B climates dominate the region. Saudi Arabia only receives an average of four inches of precipitation per year. The southern portions of the peninsula are some of hottest places on Earth. Summer temperatures can reach more than 120 ºF. In the south is the Rub’ al-Khali (Empty Quarter), which is mainly desert and comprises about 25 percent of Saudi Arabia. It is extremely dry and virtually uninhabited, though oil discoveries have brought temporary settlements to the region. There are no natural lakes or major rivers on the peninsula. Agricultural activity is dependent on the availability of water by rainfall, underground aquifers, oases, or desalinization of seawater. Source: Satellite image courtesy of NASA’s Sea-viewing Wide Field-of-view Sensor project and John Nevard, http://commons.wikimedia.org/wiki/File:Arabian_Peninsula_dust_SeaWiFS-2.jpg. Most of the people living on the peninsula are Arabs, and most of the peninsula’s countries are ruled by monarchs who rely on oil revenues to gain wealth. Minerals are mined in the mountains that dominate the peninsula’s western and southern regions. The highest peaks reach more than twelve thousand feet in elevation in northern Yemen. Of the countries on the peninsula, Yemen has the fewest oil resources and has had the sole democratically elected government. Saudi Arabia dominates the region in size and in oil resources. Islam, the major religion, infiltrates all aspects of Arab culture. Source: Map courtesy of University of Texas Libraries, http://www.lib.utexas.edu/maps/middle_east_and_asia/txu-oclc-192062619-middle_east_pol_2008.jpg. The holy cities of Medina and Mecca are in Saudi Arabia, the birthplace of Islam. Islam first united the many traditional groups of Arabia with religion and then with the Arabic language. The region was further united after 1902, when Abdul Aziz Al-Sa‘ud and his followers captured the city of Riyadh and brought it under the control of the House of Sa‘ud. In 1933, the lands under the control of the king were renamed the Kingdom of Saudi Arabia. Saudi Arabia is an absolute monarchy. In 1938, US oil corporation Chevron found large quantities of oil in the region, which has sustained the royal family ever since. Aramco is the state-run oil corporation. Controlling about one-fifth of the world’s known oil reserves, the Saudi royal family claims considerable power. The Saudi royal family gave safe haven to thousands of Kuwaitis, including the emir and his family, during the First Persian Gulf War (1991). Saudi Arabia allowed US and Western military forces to use bases on its soil during Operation Desert StormMilitary action to remove Saddam Hussein from power in Kuwait during the First Persian Gulf War in 1991.. Acquiescence to non-Muslims operating military bases on the same soil as the holy cities of Mecca and Medina gave extremist groups a reason to engage in terrorist activities. Out of the nineteen hijackers in the 9-11 attack in New York, sixteen were from Saudi Arabia. The Saudi government has been forced to step up its efforts against terrorism and domestic extremist groups. The entire economy of Saudi Arabia is based on the export of oil, and more than 20 percent of the known oil reserves in the world are located in Saudi Arabia. The country is a key member of the Organization of Petroleum Exporting Countries (OPEC) and has been the world’s number one oil exporter. Millions of foreign workers in the petroleum industry make up a vital component of the country’s economy. A high rate of population growth has been outstripping economic growth in Saudi Arabia. In 2010, more than one-third of the population was younger than fifteen years old, and family size was about 3.8 children. The unemployment rate is high, and there is a shortage of job skills in the workforce. The government has been working to shift its focus away from a petroleum-based economy and increase other economic opportunities; it plans to heavily invest in the necessary infrastructure and education to diversify its economy. Saudi Arabia has made several efforts to move forward and put the country more in line with globalization efforts that are modernizing the other Persian Gulf States. The World Trade Organization accepted Saudi Arabia as a member in 2005. In 2008, the king implemented the initiative for interfaith dialogue in an effort to address religious tolerance and acceptance. The first woman was appointed to the cabinet, and municipal councils held elections for its members. Source: Photo courtesy of Ammar shaker, http://commons.wikimedia.org/wiki/File:DSC00093-m.r.JPG. The royal family and most of the people in Saudi Arabia are Sunni Muslims. The country has a strong fundamentalist Islamic tendency. The law of the state is strict and supports conservative Islamic ideals. The Wahhabi branch of Sunni Islam has a major influence on culture. Activities such as gambling, alcohol consumption, and the promotion of other religions are outlawed. Alcohol and pork products are forbidden in accordance with Islamic dietary laws. Movie theaters and other Western-style productions are prohibited but can be found in areas where workers from other countries live in private compounds. Though movie theaters are restricted, movies on DVDs are not prohibited and are widely available. The dress code in Saudi Arabia strictly follows the Islamic principles of modesty. The black abaya (an article of clothing that looks like a cloak or robe) or modest clothing is appropriate for women. Men often wear the traditional full-length shirt and a headcloth held in place by a cord. In Saudi Arabia, human rights organizations, legal associations, trade unions, and political parties are banned. The country maintains a tight censorship of all local media. The press is only allowed to publish what the government permits it to report. Communication with foreigners, satellite media, and Internet access are highly controlled. Those who speak out against the government can be arrested or imprisoned. Former First Lady Laura Bush meets medical staff in Saudi Arabia. Note the women’s attire. Source: Photo courtesy of the White House, taken by Shealah Craighead, 2008. The Sharia is the basic criminal code in Saudi Arabia, along with whatever law is established by the king. A wide range of corporal and capital punishments—from long prison sentences to amputations (arm or foot), floggings, and beheadings—are proscribed for legal or religious offenses. Trials are most often held in secret without lawyers. Torture has been used to force confessions that are then used to convict the accused. Torture techniques—including the use of sticks, electric shocks, or flogging—can be applied to children and women as well as men. Executions are usually held in a public place every Friday. Men hold the dominant roles in Saudi society. Under strict Islamic law, women do not have the same rights as men, so Saudi women do not have the opportunities that women in many Western countries have. For example, it is not customary for a woman to walk alone in public; traditionally, she must be accompanied by a family member so as to not be accused of moral offences or prostitution. The mutawa’eenReligious police in Saudi Arabia that monitor social behavior in public. (religious police) have the authority to arrest people for such actions. The punishment could be as many as to twenty-five days in prison and a flogging of as many as sixty lashes. Women are not allowed to drive motor vehicles. Women must wear modest clothing such as the black abaya and cover their hair. Women can only choose certain college degrees. They cannot be engineers or lawyers, for example. Women cannot vote in political elections. Women cannot walk in a public spaces or travel without a male relative. Women are segregated from men in the workplace and in many formal spaces, even in homes. Women need written permission from a husband or father to travel abroad. Marriages can be arranged without the woman’s consent, and women often lose everything in a divorce. Saudi Arabia is a country steeped in tradition based on the heritage of its people, and many of the traditions regarding women were implemented to protect and care for them. However, as the forces of globalization seep into the fabric of society, many of these traditions are evolving and changing to adapt to the times and to a more open society. Women are asserting themselves in the culture, and many of these long-standing traditions are starting to break down. In late 2011, there were a number of women who organized to defy the ban on driving. One woman was arrested for driving a car and sentenced to ten lashes. Saudi King Abdullah then overturned the sentence and promised to support or protect women’s rights. There is no law stating that women cannot drive a vehicle. The taboo is based on tradition and religious views. More women have taken to the roadways in spite of the taboo against it.“Saudi Arabia: Woman Driver Verdict Reportedly Overturned By King,” Huffington Post, http://www.huffingtonpost.com/2011/09/28/saudi-arabia-woman-driver-verdict_n_985857.html. Saudi Arabia is an example of how Islamic fundamentalism is being challenged by modernity and democratic principles. Kuwait, a small country located on the Persian Gulf, is a monarchy ruled by an emir from the royal family. Immense oil reserves have made Kuwait attractive to international oil investors. In 1961, Zapata Oil Company (now Pennzoil), owned by former US president George H. W. Bush, drilled the first offshore Kuwaiti oil well in the Persian Gulf. Thanks to ample oil revenues, the small Kuwaiti population (about three million people) has adequate social services. The country has a high standard of living. Education is free, and much of the labor base comes from non-Kuwaiti migrants. Petroleum exports account for most of the government’s income. Kuwait has an excellent port at Kuwait City. However, one of the environmental problems with building a large city in the desert is the shortage of fresh water. To solve this problem, Kuwait has turned to the desalinization of seawater to provide for its domestic, agricultural, and industrial needs. The United States and an international coalition fought the First Persian Gulf War in 1991 to “liberate” Kuwait from the grip of Saddam Hussein. It is compelling to note that the war was not about democracy. The war was about the control of oil resources. Under Hussein, Iraq invaded Kuwait and took over its enormous oil industry and port facilities. By taking over the oil assets, Hussein was in actuality taking over the oil assets of various international oil corporations. With the support of United Nations (UN) resolutions demanding that Hussein leave Kuwait, President George H. W. Bush organized an international military coalition to remove Hussein from Kuwait. The US mission was called Operation Desert Storm. The war started on bases in Saudi Arabia and pushed the Iraqi army out of Kuwait. When Hussein realized that he could not benefit from the oil in Kuwait, he had approximately 750 oil wells in Kuwait dynamited, which caused serious well fires and large lakes of oil flowing out onto the desert sands. The fires and spilled oil caused extensive environmental damage. 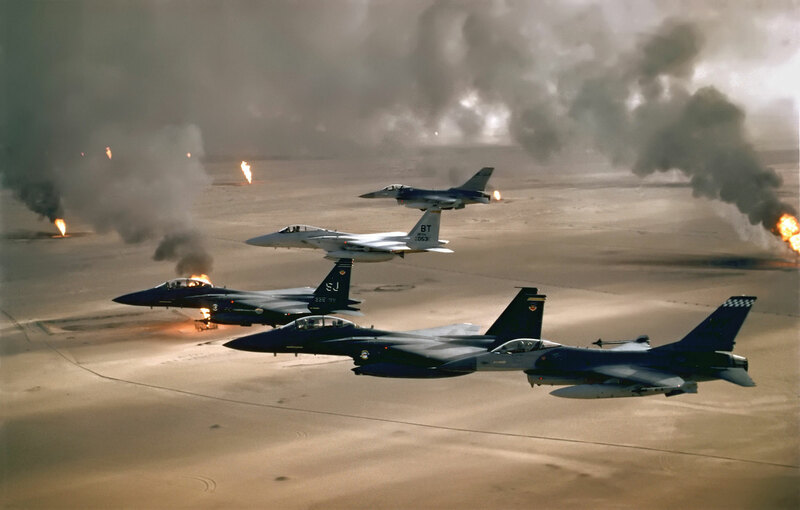 US fighter jets in Operation Desert Storm fly over burning oil well fires in Kuwait. The fires were set by retreating Iraqi forces. Source: Photo courtesy of the US Air Force, http://commons.wikimedia.org/wiki/File:USAF_F-16A_F-15C_F-15E_Desert_Storm_edit2.jpg. Kuwait was not a democracy during the Persian Gulf War and is not a true democracy today. It is considered a constitutional emirateAn Islamic political unit governed by a ruler, chief, or sheik.. The emirA ruler or chief in Islamic countries., or head of the royal family, is the head of state. He appoints the prime minister and has a high level of control over the government. The emir has the authority to dissolve the National Assembly, which has members that hold seats by election. A number of groups wish to have a political voice in the government, including Islamists, business merchants, secular liberals, Shia activists, and a small number of local groups. Islamist groups are usually those who support an Islamic religious state as the desired type of government. Kuwait had to invest nearly five billion dollars to reestablish the oil industry after the Persian Gulf War, but the emirate has recovered, and its economy is growing with the increased sale of exported oil. Kuwait has about 104 billion barrels of oil in known reserves. In 2010, the four largest export partners were Japan, South Korea, Taiwan, and Singapore, which are all economic powers in East Asia that have to import almost all of their energy and raw materials. The US has traditionally been Kuwait’s number one source of imported goods. Bahrain is a small archipelago (group of islands) in the Persian Gulf. The country received its independence from Great Britain in 1971. Iran has made claims on the islands to no avail. Similar to other small monarchies in the region, Bahrain has lots of oil and a small population. Though more than 50 percent of the population is Shia, the country is opening up to democratic reforms. In 1999, elections were approved for a parliament, all political prisoners were released, and women were allowed to vote. The royal family, ruled by the king, has had an enormous degree of power over its government. Officially, Bahrain is a constitutional monarchy, but the king appoints the members of the upper house in its bicameral legislature. The first female was appointed to a cabinet position in 2004, which was an indication of the move toward openness to the globalization process and modernization. Some in the country think the implementation of these measures is still too slow. 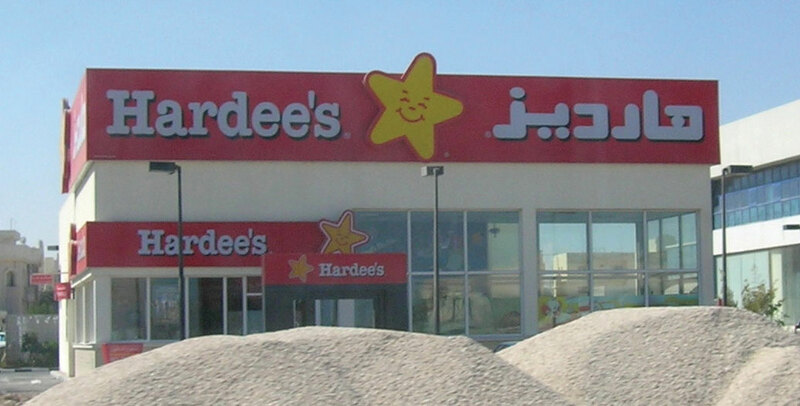 This Hardee’s franchise in Bahrain is a clear example of Americanization of the Arabian Peninsula. Source: Photo courtesy of Brent Gullet. Most of Bahrain’s wealth is gained through the extraction of natural resources. Enormous natural gas reserves are located in Bahrain’s coastal waters, and oil now makes up about 60 percent of the export profits. The small land area size of the country, lack of sufficient supplies of fresh water, and few other natural resources has prompted a shift for Bahrain to expand into the financial sector. Islamic banking and financial services for the global marketplace have been an expanding sector of the economy. The objective in diversifying the economy is to reduce the dependency on oil as a future source of national wealth. In addition, the United States has entered into a free-trade agreement with Bahrain, which has attracted multinational corporations to do business in the region. Bahrain has been supportive of a US military presence for both protection and cooperation and is the permanent headquarters for the US Fifth Fleet navel operations. In a mutual defense agreement, some one thousand American navel officers and personnel are stationed on the island. Bahrain has been a frontline state for the US military in the Iraq War and the war in Afghanistan. The country is also opening up development in the service sectors. Tourism is not what usually comes to mind when one thinks about the Arabian Peninsula, but Bahrain has been attracting millions of visitors yearly. The country’s authentic heritage is attractive to tourists from neighboring Arab states and the global community. The country boasts of nearly five thousand years of human activity. UNESCO has designated the Qal’at al-Bahrain castle as a World Heritage Site. The country has invested heavily in modern shopping malls and international sports facilities in an effort to modernize its country and attract more international events. The citizens of Bahrain have had to work to balance the shift toward modernization and globalization with the strong Arab heritage and Islamic beliefs that have been the foundation of their culture. The term Middle East Lite has been applied to Bahrain because Bahrain has been investing in modern infrastructure but has worked hard to maintain its Arab heritage with a Persian Gulf identity that is more accepting and open to the outside world. The growing and prosperous middle class is more tolerant and liberal than many of its Middle East neighbors. The same level of tolerance toward outsiders has not been witnessed within the country. The 2011 protests and demonstrations that swept across North Africa and the Middle East also occurred in Bahrain. The king, the royal family, and the majority in government follow the Sunni branch of Islam; however, most of the population follows the Shia branch of Islam. Many within the Shia community felt that they were being discriminated against and protested the lack of democratic reforms. Protests and demonstrations in Bahrain have prompted the government to call in military support from Saudi Arabia to help quell the uprising. A number of Shia mosques were reported to have been destroyed, and hundreds of people were detained by police. The protests and demonstrations in Bahrain are more than just a conflict between Shia and Sunni, though this split has been a major concern for years. Many Sunni have participated in the demonstrations because they are in support of more democratic reforms as well. 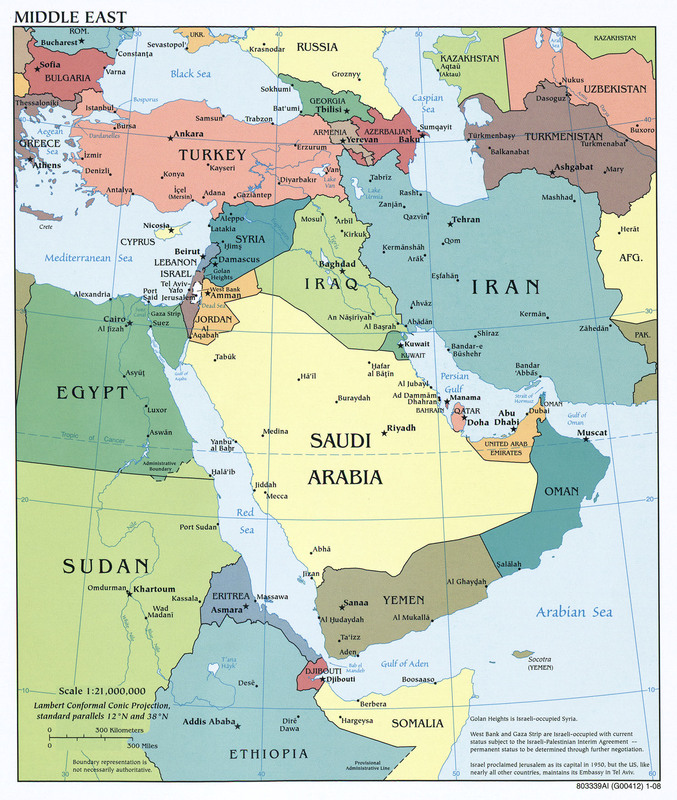 The small peninsula jutting out from Arabia into the Persian Gulf is an Arab land in transition. Ruled by an emir who has supported democratic reforms, Qatar is moving forward with a globalization policy similar to other Westernized nations. Many of these reforms are similar to those in Bahrain and the United Arab Emirates (UAE). Oil and gas exports have fueled a building boom that has produced shopping malls, wide boulevards, and even a large US military base. Women are allowed to vote, Western clothing and products are permitted, and rap music can be heard in the streets. Though still politically restrictive in many ways, Qatar is more open than many of its neighbors. Qatar is also home to the Al JazeeraInternational news agency based in Qatar. news organization, which often balances out Western news programming. Al Jazeera is also allowed to report critically on its home country. In the past few years, oil revenues have provided Qatar with a rapidly growing economy and a high standard of living. Proven reserves of oil and natural gas are enormous for such a small country. Qatar’s natural gas reserves are the world’s third largest. Qatar has been pursuing development of private and foreign investments in non-energy-related businesses, including banking and financial institutions. Revenues from oil and natural gas are fueling the rapid development of this small peninsula that is rivaling core economic countries. Modernization efforts have supported Qatar’s push for a greater emphasis on education. Infrastructure and financial support have been allocated to support educational reform, and university opportunities are expanding rapidly. Qatar University was founded in 1973, and in the last decade many more universities from Western countries have opened up branch campuses in Education City, which was established to advance Qatar’s educational reform goals. The emir’s second wife has actively promoted educational reforms and has encouraged women to pursue higher education to excel in their careers. She has also created greater visibility for women in public roles and has broken through some of the cultural barriers and taboos that have restricted women in other conservative Islamic Arab countries. Seven small Arab emirates joined together in 1971 to form the UAE. Each emirate is an absolute monarchy ruled by a sheikAn Arab chief.. The UAE has been integrating its economy with the global marketplace and has established a high standard of living for its people. Two of the emirates—Abu Dhabi and Dubai—possess most of the oil reserves. Abu Dhabi is the capital city and consists of 87 percent of the land area in the UAE. The head of the royal family in this emirate is considered the head of state for the UAE. It is evident that one emirate, Abu Dhabi, dominates in terms of square miles of physical area. Dubai has turned its small emirate into an international trade center. The emirate has used its oil reserves to promote trade and commerce. Dubai built itself a world-class port facility equaling that of Hong Kong or New York. As a free-trade zone, there are no taxes or tariffs, so international corporations use the location as a trade center to bring high-volume buyers and sellers together. Dubai has been looking ahead to its future when the oil runs out. The creation of an international trade center would be a means to gain economic income when the revenue from the sale of oil diminishes. Oil wealth and the need for workers have opened up economic opportunities in the UAE that have attracted laborers and businesspeople from many parts of the world. Noncitizens make up about 80 percent of the population; about half the noncitizens are from South Asia, and many are Muslims from India. The large number of laborers that are required to develop the infrastructure has created an imbalance between the percentage of men and women. There are about twice the number of men than there are women in Dubai. This has created an interesting dynamic for women in Dubai, who have more rights and opportunities than those in more conservative Islamic countries such as Saudi Arabia. The UAE presents an excellent example of people migrating from peripheral countries to a core region in search of opportunities and advantages in a globalized economic community. The UAE has invested its oil income in building up its infrastructure to compete in a global economy. Hundreds of billions of dollars of construction projects are under way in Dubai alone. Dubai has the world’s tallest structure, the most expensive hotel, the world’s most expensive airport (when completed), and the world’s largest artificial islands. Dubai is even home to an indoor downhill ski resort complete with real snow. Other ventures such as the Dubailand entertainment complex and Dubai Sports City have also been proposed. The downturn in the world’s economic situation has slowed the development in this emirate but has not diminished its perspective on the future. The skyline of Dubai includes the tallest building in the world. Source: Photo courtesy of Paul Wilhelm, http://commons.wikimedia.org/wiki/File:Dubai_2010.JPG. Ruled by a sultanA sovereign of a Muslim state., the absolute monarchy of Oman on the southern end of the Arabian Peninsula also controls the tip of land next to the Strait of Hormuz. All oil tankers leaving the Persian Gulf must pass through this vital choke point. Mountains reach more than nine thousand feet in the eastern region of Oman, and rugged arid central plains cover the central region. The country gets plenty of sunshine and has some excellent beaches. Annual rainfall varies from four inches or fewer in the eastern sector to as much as twenty-five inches in the southwest. The climate is generally hot: temperatures can reach 120 °F from May to September. Oman has been using its oil income to build infrastructure to benefit its people. The sultan of Oman has widespread support from his people and has built up goodwill from the international community for his investments in his country. He has built a free-trade zone with a giant container port facility, luxury tourist hotels, a good road system, and a first-rate international airport. He has also provided clean drinking water to the rural areas. Though Oman is not a democracy, the sultan has been positive role model for other monarchs. He has used Oman’s oil wealth to help his country develop and modernize. The mountains of Oman have additional natural resources such as gold, marble, and copper. A lack of fresh water is a concern for Oman. The nation has limited renewable water resources. More than 90 percent of the water available is used in agriculture, and the rest is used for industry and domestic consumption. Fresh water is piped throughout most of the country, but shortages occur at times because of droughts and limited rainfall. Environmental problems have also arisen in Oman. For example, irrigation operations have caused soil conditions such as a salt buildup. Oil tankers traveling through the Strait of Hormuz and along the coast in the Gulf of Oman have leaked oil, which has washed up on coastal areas where attractive beaches are located. The higher level of exploitation of the environment by a growing population has exacted a toll on the organisms that live in the fragile desert ecosystems. Mammals, birds, and other organisms are in danger of extinction, including the Arabian leopard, the mountain gazelle, and the Arabian oryx. The country may lose its biodiversity unless action is taken toward preservation. 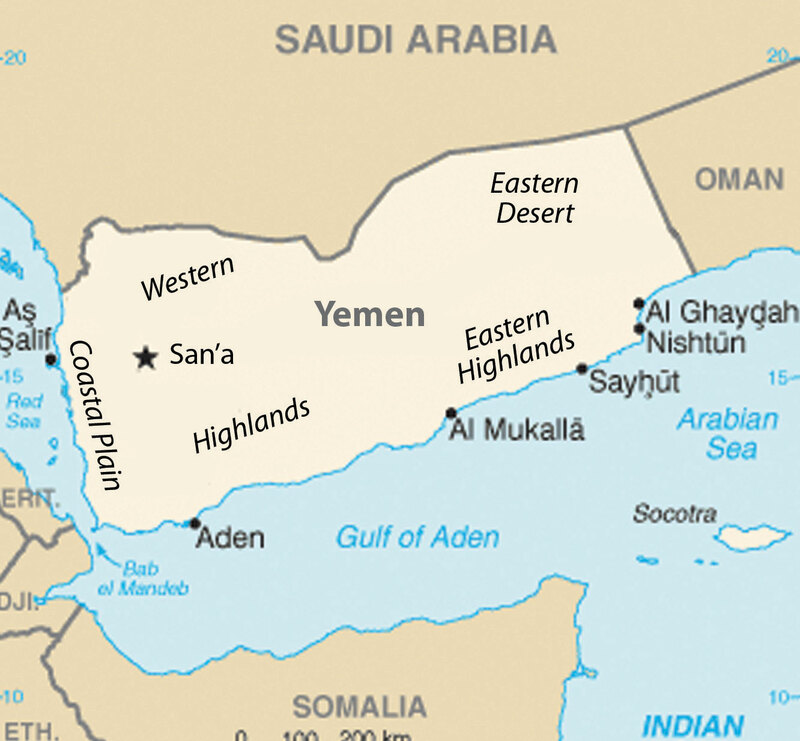 Yemen is a mountainous country bordering Oman and Saudi Arabia. The tallest mountains on the peninsula—reaching more than twelve thousand feet in elevation—are located here. The four main regions of Yemen are the eastern desert region of the Rub’ al Khali; the Eastern Highlands south of the Rub’ al Khali; the Western Highlands, which have the highest peaks; and the western coastal plains. The Western Highlands receive about thirty inches of rain per year, while the eastern desert received almost no rainfall. A number of volcanic islands are located off the coast. A volcano on one of the islands erupted as recently as 2007. This region is an extension of the rift valley system coming out of East Africa. The highest peak in the Western Highlands is 12,028 feet in elevation. Source: Map courtesy of CIA World Factbook. The economy has traditionally been based on agriculture. Most of the farmland is in the form of terraces cut into the mountainsides that trap rainwater as it flows down the slope from one terrace to the next. Food production is a primary concern because in 2010 the population was more than twenty-four million and increasing rapidly. The arid land has few trees, but firewood is in high demand for cooking. The demand for firewood has caused deforestation, which in turn has caused serious soil erosion and damage to the mountain terraces that produce the food. Yemen is facing serious environmental concerns. The fast-growing population will only put more pressure on the environmental systems. On the positive side, oil and natural gas reserves are being found in some quantities, which will assist with the economic conditions and help supply the energy needed in the future. Women in Yemen do not have the opportunities available in some of the more urbanized and modernized Gulf States. The contrast between the rural dynamics of Yemen and the urban culture of Dubai provides an excellent example of a rural versus urban or a core versus peripheral spatial relationship. The basic formula of family size and income levels applies to Yemen. In 2010, the fertility rate declined to 4.8 from more than 7.0 in 2000.“Total Fertility Rate (Children Born/Woman),” IndexMundi, http://www.indexmundi.com/g/g.aspx?c=ym&v=31. Rural-to-urban shift is causing cities within Yemen to grow at an increasing rate. Large family sizes are forcing young people to seek out opportunities and advantages in the cities or in other countries. The situation is only going to intensify, as the population of Yemen is projected to reach sixty million by 2050 at the current rate of increase. Yemen has a democratically elected government that came about when North Yemen and South Yemen merged into one country to create a democratic republic in 1990. The population of Yemen is about 40 percent Shia and 60 percent Sunni. Yemen sided with Iraq and Saddam Hussein in the First Persian Gulf War in Kuwait, which resulted in Saudi Arabia expelling thousands of Yemeni workers. Yemen and Saudi Arabia have had a long-standing territorial dispute and only recently agreed on the desert border between the two countries. As the lone democracy on the peninsula, Yemen contrasts with the more conservative Islamic states and monarchies such as Saudi Arabia that are more common in the Middle East. Poor, rural, and agriculturally based, Yemen does not fit the mold of the typical oil-rich sheikdom of the region. The cultural forces within Yemen demonstrate the dichotomy between modernization with democratic reforms and fundamentalist Islamic tendencies. Stability in Yemen is critical for the security of the regional waterways. In the past decade, piracy against ships off the coast of Somalia has increased, and many ships have been boarded and taken hostage by pirates demanding high ransoms for the release of the ship and crew. Security in the region is critical to support safe passage for international shipping activity through the Gulf of Aden and the Bab-el-Mandeb Strait. Yemen experienced civil unrest and citizen protests in the spring of 2011 similar to those in the other Arab countries. The protests and demonstrations targeted political corruption, economic conditions, and high unemployment. During this time, the government was also looking to modify its constitution. The protesters shifted their focus to call for the president of Yemen to resign after twenty-one years in power. The president and government resisted, and the conflicts turned more serious. Clans not loyal to the president sided with the protesters, and the Yemeni president was seriously injured in a military clash. He was flown to Saudi Arabia for medical treatment. When the president recovered and returned to Yemen he still refused to step down. The country continues to adjust to the situation. 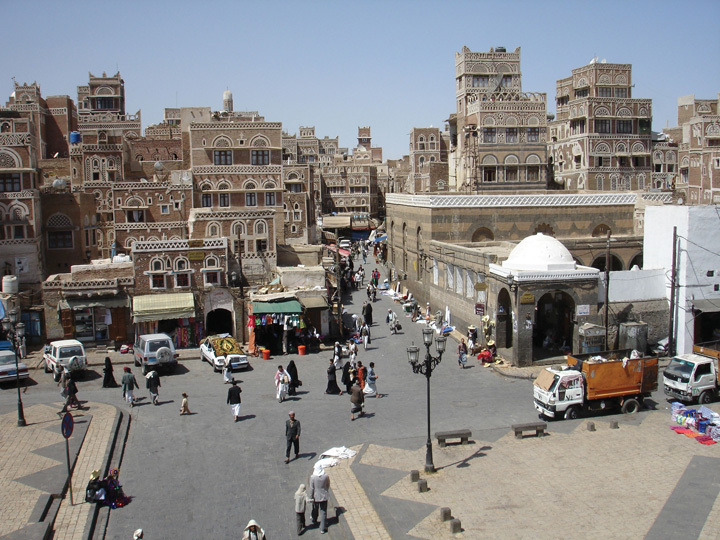 Sana’a, an ancient city, is the capital of Yemen and the largest city, with a population of more than two million people. Source: Photo courtesy of stepnout, http://www.flickr.com/photos/stepnout/2345728292. 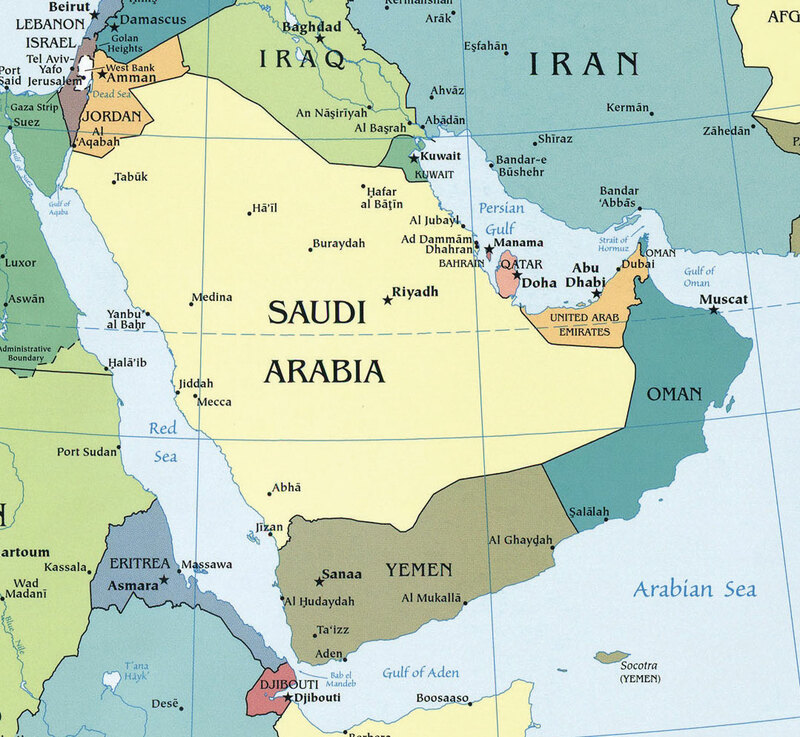 The Arabian Peninsula is a desert region. The Rub’ al-Khali (Empty Quarter) provides an example of desert extremes. The mountains along the western and southern edges receive the most rainfall. There are no rivers or major lakes on the peninsula. Water, a resource that is vital to human activity, is scarce throughout the region. The export of oil and natural gas is what drives the economies of the region. Many of the states are working to diversify their economies with banking, free-trade zones, and even tourism. Yemen is the only country with a truly democratically elected government. Leaders of royal families rule in the other countries as heads of state with varying degrees of shared governance. Family size varies widely in the region, from more than 4.5 in Yemen to around 2.5 in the progressive Gulf States of Qatar, the UAE, and Bahrain. Women’s rights and opportunities have an inverse relationship with family size; that is, when women’s rights and opportunities increase, family size usually decreases. In the Gulf States, the smaller countries in land area are more open to promoting women’s rights and responsibilities in the public and private sectors. Where are the mountains located on the Arabian Peninsula? How high do they reach in elevation? Why type of government does Saudi Arabia have? What is the law based on? What are some things that women are not allowed to do in Saudi Arabia that they can do where you live? Who are the mutawa’een? When would one encounter them? Who drilled the first offshore Kuwaiti oil well? Why is this significant? What measures have the governments of Bahrain and Qatar taken to modernize their countries? How has the emirate of Dubai been able to promote a globalized economy? Why does the term Middle East Lite apply to Bahrain? How has the current sultan of Oman used his country’s oil revenues? Outline five differences between the emirate of Dubai and the country of Yemen. Check the news for world affairs and follow up on what is happening with the protests in Bahrain and Yemen. Analyze how those two countries have been addressing their internal issues. Find a way to access the English version of Al Jazeera news broadcasts and compare its coverage with the coverage from other international news agencies.